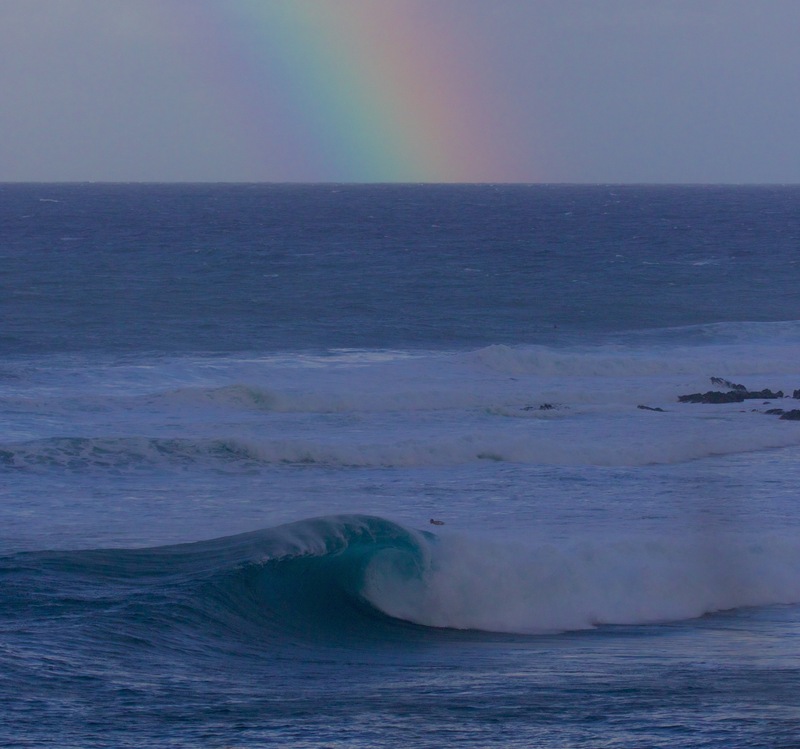 Hawaiian shorebreak is different than others. The waves are faster and thicker…more menacing. They grow more on the sandbar. The cleanup, sneaker sets are more frequent. Somehow, the barrels are rounder and more square at the same time. Even surf spots far from maximum swell exposure receive deep water wrap and turn inside out. Having visited Oahu 5 years ago, I instantly fell in love with Hawaii. My best friend Brooke is from Maui and always speaks of its majesty. So this past year, I bolted for the second largest island in the Hawaiian chain and it quickly became my favorite place I’ve visited. I arrived in Kahului at 9pm on Saturday night, rental car pick up and I was quickly on my way to my room in Paia. The forecast for the week showed a series of solid north swells with likely strong tradewinds from the northeast. I woke up at 5am on Sunday and immediately drove the hour to the dream spot. The spot with the glorious green landscape and the long roping waves wrapping into the Bay and that one section, known as the Cave, that I’ve stared at endlessly on YouTube. After driving past dozens and dozens of beachfront high-rises and resorts, the coast opens to reveal relatively untouched terrain. A true gem of the world’s coastlines. I attempted to pack as much of Maui into my week as possible, with an obvious focus on waves and that particular northwest corner of the island. I very much enjoyed the surf nerd fanhood opportunities available around the Island. Watching Clay Marzo ride dangerous spots that few others would consider, witnessing the best women in the world warm up for the Maui Pro and watching Kai Lenny foilboard open ocean swell all stoked out my inner surf fan. 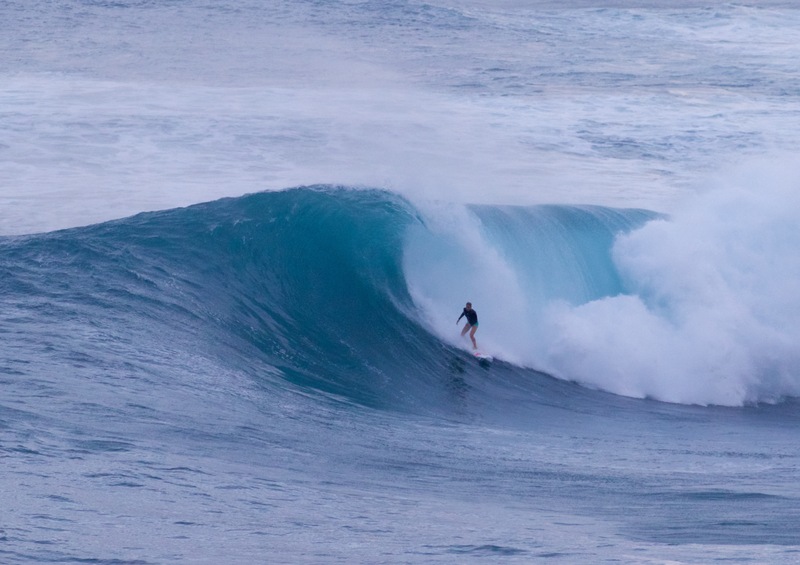 Wednesday was between swells so i decided to chase a classic Maui tourist day. 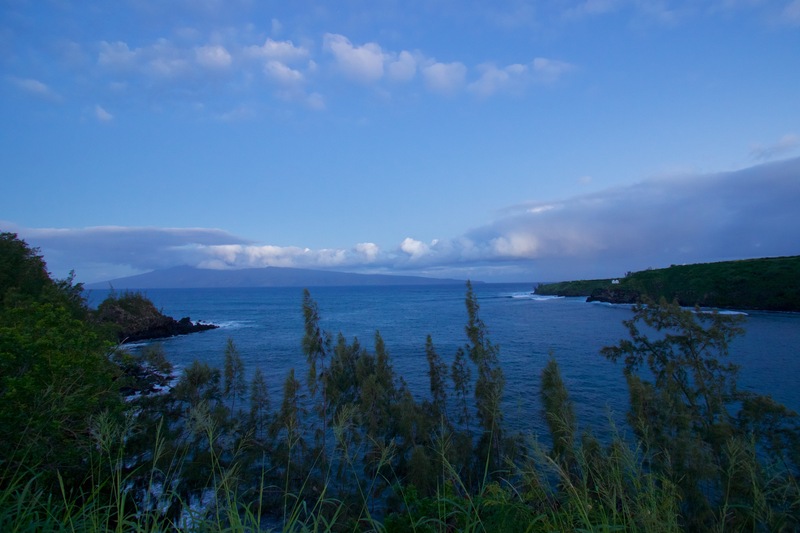 I woke up at 5am and began along The Road to Hana. About a dozen stunning roadside waterfalls later, I couldn’t imagine what this sometimes single lane road would be like with full tourist traffic. Glad I was the first to reach the beautiful small town of Hana that morning. I continued around the east side, looking for a beach that was recommended numerous times. This small cove is the most idyllic little place I could ever imagine: the neon green hillside drops down to jagged volcano rock coastline with a small crescent of perfect sand. Nobody else around…this is where I envision myself living into my 90s. There was just enough swell to reveal some interesting potential and neon blue shorebreak tubes welcomed me for an enjoyable swim. I continued around the south side and was struck by its remote beauty. My little Chevrolet did awesome on the sometimes unpaved and wildly winding road. I loved seeing the ecological difference between the windward and leeward sides of the island. From cloudy tropical forest to arid sunshine in a matter of miles. Trusty little ride and the stunning Leeward side. 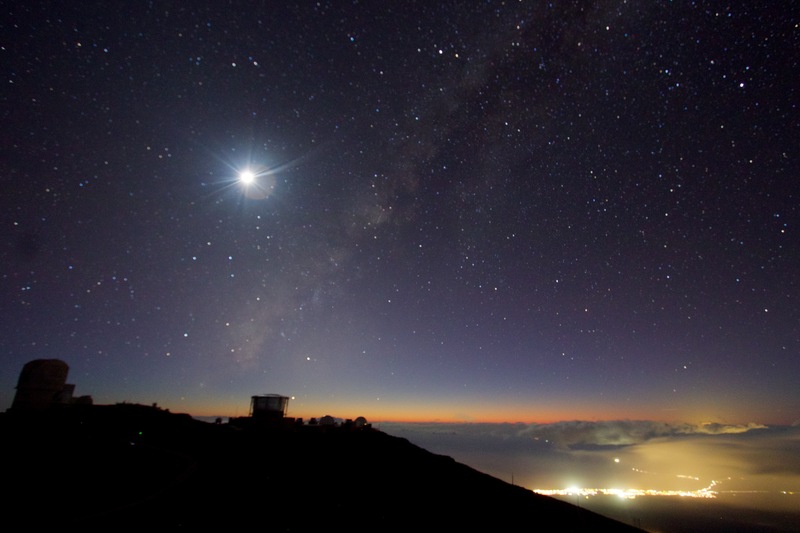 With time to spare in the afternoon, I drove straight to the top of Haleakalā National Park. Rising 10,023ft straight out of the Ocean, this volcano makes up most of the eastern part of Maui. Clouds filled the famous summit craters when I arrived but the low sun created wicked optical effects shining through the moisture. As the sun began to set, hundreds of people filled the summit and the sky actually cleared enough to provide views of Mauna Kea across the channel to the Big Island and a beautiful pink sunset next to Science City. Being wholly unprepared for 10,000ft of elevation at night, I climbed back into my car shivering violently. It was a must that I experience the dark night sky from here so I turned the heat on high and waited. After about 30 minutes the shivering subsided and the cosmos emerged in the ink black sky. What a beauty! I could only manage about 10 minutes outside before the shivering restarted. It took awhile to regain my bearings from the cold as i drove slowly back down the gigantic hill. A classic Maui day. All told, I bodysurfed about a dozen different spots around the island including one particularly glorious wave at the aforementioned Cave. From slabbing shorebreak on the West Side in front of the countless resorts, to peaky fun shorebreak near Paia on the northside. I hung out with my good buddy Duke who graciously showed me around and met Brady from @we_bodysurfers. I went to lunch my dear friend’s father Ned and had a chance encounter with fellow Ohioan, filmmaker and bodysurfer Michael Donohue (@blue_motion_pictures). Before getting on the plane, I managed to swing down to the southside and snorkel with sea turtles and check out the infamous Big and Little Beaches. What an incredible bit of volcanic rock! The potential for fun waves around every corner, gorgeous beaches, amazing terrain and friendly people. I will reside on Maui someday.